Home » Reviews » IdealLean Burner Review – Does it Actually Work? Discover whether you should be spending your money on IdealLean Burner with our in-depth review. Widely known as one of the most popular fat burners for women, IdealLean Burner has been a firm favorite of female fitness fanatics for a while. But does it really work? From the name, product design and overall marketing, there’s no disputing from the packaging and marketing that it’s targeted at women. We want to know if the ingredients within the formula are also suited to the fat burning needs of women. It may come as no surprise to you that for women, dieting is a very different experience compared to men. Our genetic and hormonal make up means we’re more susceptible to cravings when we’re hungry or restricting our food intake. As such, temptation can often mean the end of a diet for women – we’ve all been there. A really effective fat burner for women should cater to this and provide support that will keep you on track and reaping the rewards of your diet. IdealLean Burner should also provide an energy boost that will help you to lead a more active lifestyle and stay up-beat and motivated whilst you’re on a low-calorie diet. On top of that, it needs to boost your metabolism to increase your overall calorie burn. This will heighten the amount of fat your burn throughout the day, and in workouts. To find out for sure if IdealLean has what it takes to help women lose fat, we need to perform an in-depth review of the supplement and discover just how well it will complement your fat loss journey. As we review, we’ll be looking out for all those key signifiers of a quality, intelligent fat burner. We’ll analyze each ingredient and compare it to scientific research to explore the effectiveness and value of every element of the formula. After that, we’ll ascertain the safety of the supplement. This is essential for us, as we only recommend the best and safest fat burners to our readers – anything that could results in side effects of adverse symptoms is off the cards. When we have all this information, we compare our findings to the price of the product. This helps us to create a tangible idea of the value of the product. This helps us to find out if its worth your money or if you should look elsewhere. What are the benefits of taking IdealLean Burner? How do you take IdealLean Burner? How much is IdealLean Burner? Upon close review, we found the main benefit of IdealLean Burner is that it will improve your ability to burn fat. Read on for more information on what to expect from this supplement. There are thermogenic ingredients within this formula that help to boost your metabolic rate. They do this by heating your body up slightly, so it has to work hard to lower your temperature. This process needs energy, so your body is consistently burning more calories than it normally would. The IdealLean Burner formula contains a natural stimulant that helps to keep energy levels high, so you can maintain an active lifestyle. By improving energy levels, you can also benefit from improved motivation to hit the gym and stay active, which is an essential part of weight loss. When taken correctly, this formula is side effect free. It has a reasonable dose of caffeine and all of its ingredients are taken from completely natural sources, significantly reducing the chance of adverse symptoms. These elements combine to improve your overall fat loss. They’ll contribute by allowing you to burn more calories, which will eventually lead to more fat burned. We’d also like to note that, with this fat burner, we’re missing some key benefits. The most sophisticated weight loss supplements on the market today offer the intelligent approach of suppressing the appetite. At SpotMeGirl.com, we find it especially important to include these in female-focused fat burners, as they provide an extra buffer against cravings, which can quickly bring about the end of a diet for women. The IdealLean Burner formula is made up of entirely natural ingredients and doesn’t contain any proprietary blends. These two factors are extremely reassuring for us, as they significantly reduce the risk of side effects. This formula also contains caffeine. To ensure safety with this powerful stimulant, we suggest you don’t exceed their recommended dosages, especially if you’re sensitive to caffeine. The amount in IdealLean isn’t anything to be worried about, however, it’s worth being careful with stimulants, as too much can lead to adverse symptoms. Look out for nausea, dehydration and migraines if you are sensitive to caffeine. To avoid this, drink plenty of water throughout the day and lower your overall caffeine intake by having less coffee and tea. Taking caffeine is also a bad idea if you’re pregnant. If there is any chance you could be, speak to a physician before you purchase this fat burner. The IdealLean Buner is made up of 10 ingredients all taken from natural sources. After closely reviewing the formula we can say we’ve found some very well-researched, highly-recommended fat burning ingredients. We’ve also found some that lack scientific backing, which don’t quite make sense in this kind of supplement. We also feel that this supplement is missing a key element – appetite suppressants. Including these in an intelligent supplement decision. Especially considering women are more likely to suffer from cravings than men. Ultimately, we were disappointed not to see appetite suppressants in this product. To help you understand how this affects the performance of Burner, we’ve pulled out the main ingredients and reviewed the latest research. Check it out. Carnitine is produced within the body and is found in just about all your cells. L-carnitine tartrate is a supplement version of this. It’s used within fat burners because it plays an important role in the energy production process, helping your body turn to stored fat for fuel. This means that whether you’re working out or sat in the office, you should be creating energy in a more efficient way, that helps to melt away fat. However, it has been shown to work with dosages of around 200mg. IdealLean Burner contains only 150mg, which falls short of the recommended amounts and will impact the effectiveness. This ingredient confused us as part of a fat burner. It doesn’t actually impact your ability to lose fat, instead it’s been added to improve your mood. We can understand the intention behind this addition, as we know being on a low-calorie diet can be hard work. However, when we looked into the research behind it, we struggled to find hard proof that supplementing with b-phenylethylamine can impact mood. There aren’t any facts out there to warrant it’s use in this formula. 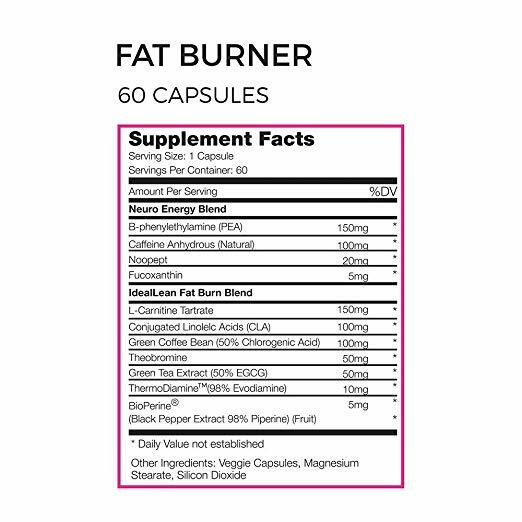 In the world of fat burners, caffeine is hugely effective ingredient, and one we’re very happy to see in the IdealLean Burner formula. We’re very familiar with this stimulant and know it’s been proven to boost both energy and metabolic rate . With more energy you can lead an active lifestyle that will support a weight loss diet. Your heightened metabolism will complement this and help you to burn more calories, and fat, throughout the day. It’s also been shown to improve overall strength in a workout, so when you do hit the gym, you can expect to go harder than ever before . We’re glad this ingredient made it into the IdealLean Burner mix. Standardized to 50% chlorogenic acid, this is a powerful thermogenic addition. The chlorogenic acid has been shown to boost general health and well-being, but can also stimulate thermogenesis . It also cuts glucose levels in the liver, forcing your body to use stored fat as a resource for energy. These work together to improve your overall fat loss potential. However, within IdealLean Burner, we found the dosage to be a little underwhelming. Science shows chlorogenic acid had the best effects when supplemented at around 140mg . IdealLean offers a green coffee bean serving of just 100mg, which equates to a much smaller measurement of chlorogenic acid. This is another potent ingredient for a fat burner. Green tea contains catechins which have powerful thermogenic properties. They’ve been proven to increase your levels of norepinephrine, which then leads to the increased thermogenesis . This works synergistically with the caffeine within this mix to increase your overall metabolism and increase how many calories you burn in a day . However, we’d prefer to see this extract at a more generous dose to see a substantial impact on your fat loss journey. A serving of just 50mg is very low compared to the majority of powerful fat burners we’ve seen. 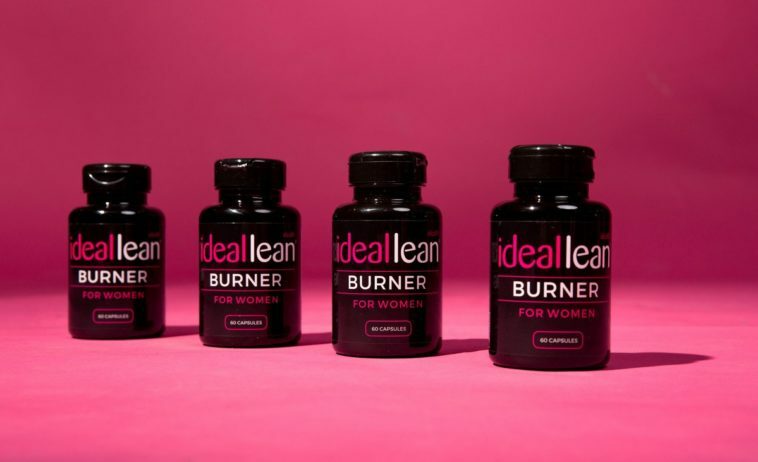 The creators of IdealLean recommend you take one or two capsules of Burner a day, although they say a bottle of 60 capsules offers 60 servings. We’d highly recommend you decide to take two capsules a day. Although we know this cuts the servings per container in half, we think it’s the only way you’ll feel any real benefit from this fat burner. Several of the ingredients are under dosed and spreading your intake out throughout the day is the best way to ensure you maintain thermogenesis. We’ll factor this change in serving size into the value of the product. Ideally, we’d rather see more intelligent dosages spread out over three or four capsules for maximum effect. However, if you took that many at the current doses, you could be at risk of side effects. Leave at least three hours between taking these capsules to avoid a caffeine spike. One bottle of IdealLean Burner offers 60 capsules, which should be enough for 30 days based on two capsules a day. If you’re looking to maximize results from your weight loss journey, IdealLean Burner isn’t the best supplement for the job. There’s no doubt in our minds that it may help to boost your fat loss a little and increase energy. But, if you’re looking for something with real transformative power, IdealLean Burner isn’t worth the money. For us, and for measurable results, this formula just isn’t sophisticated enough. The dosages aren’t optimal based on scientific research, it doesn’t contain an appetite suppressant and several ingredients just aren’t necessary or proven to work. A big sticking point for us is the lack of appetite suppressant in a women’s fat burner. They’re an essential part of the support system we expect from a female weight loss supplement. It shows us this supplement is under-researched and uninformed on the needs of women. We also don’t think the suggestion of one capsule a day is enough. We recommend two, but really, we’d like to see this supplement spread out across three or four capsules to maintain energy levels and thermogenesis. With just one a day, you’ll only experience a spike at these times, rather than any sustained benefits. Find out how the IdealLean Burner fares compared to other fat burners on the market and read our complete review. Wall, B., Stephens, F., Constantin-Teodosiu, D., Marimuthu, K., Macdonald, I. and Greenhaff, P. (2011). Chronic oral ingestion ofl-carnitine and carbohydrate increases muscle carnitine content and alters muscle fuel metabolism during exercise in humans. Acheson KJ, e. (2019). Caffeine and coffee: their influence on metabolic rate and substrate utilization in normal weight and obese individuals. – PubMed – NCBI.